“This is a story about the future, and the future can be scary” — the somewhat ominous first words from John Francis “Frank” Walker (George Clooney), at the opening of Brad Bird’s latest opus. 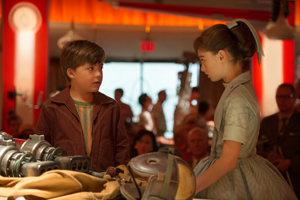 Rather than bringing us straight to the shiny future teased in the movie’s trailers, “Tomorrowland” truly begins with a visit to the past, 1964 to be exact, and the World’s Fair in New York. Young Frank (Thomas Robinson) makes his appearance at a booth for the vetting of inventions, and when a taciturn Nix (Hugh Laurie) seems to find every reason to turn down Frank’s only-barely-not-working jet pack, a sweet young pixie named Athena (Raffey Cassidy) chases him down and coyly offers him a second chance to impress with his technology. Athena hands Frank a pin with a “T” on it and orders him to follow her from a safe distance, while she then dashes ahead to the “It’s a Small World” ride (which actually debuted at the real-life 1964 Fair). Frank manages to scamper onto one of the boats and the pin ensures that he’s spirited away to a world straight out of every futuristic drawing ever produced (or perhaps from the pen of the designer of London’s Shard), where his jet pack manages to save his life almost immediately upon arrival. Frank and Athena are soon reunited and, as much as Nix dourly regards Frank, he’s unable to deny that Frank has some techno skills. Skip now to present day, where Casey Newton (Britt Robertson) is trying to sabotage the demolition of a NASA launch platform at Cape Canaveral to stave off a future that puts her engineer father out of work. “It’s hard to have ideas…and easy to give up,” she says. Given how the rest of the movie goes, I’m inclined to agree with her. Over the course of the two hour and ten minute-long film, Casey goes on your standard hero quest through space and time–to the point where I started to wonder if Bird himself gave up and just dropped scenes and concepts from “Back to the Future II”, “Percy Jackson & the Olympians: The Lightning Thief”, “Contact”, and “The Lorax” into the largest blender he could find. A strangely un-aged Athena plants a pin on Casey, who soon discovers that it has the power to show her a transformed world with the lovely dichotomy of a super-futuristic city surrounded by fields of completely untended wheat. As it happens, the pin is merely an ad; it shows Casey the visuals but none of it is real. When the time runs out on the hallucination (or very intricate hologram), she finds she’s mostly waded into a swamp. One quick internet search later, she finds a place that may have answers about the vision from the pin: a nerdtopia of a store called “Blast from the Past”, run by Ursula (Kathryn Hahn) and Hugo (Keegan-Michael Key). It’s once you get to “Blast from the Past” that “Tomorrowland” veers firmly off the “OK for Small Kids” path, when a variety of killbots sporting hyper-bleached toothy grins begin the first of several lengthy appearances, blowing up things left, right and center, and placing Casey firmly in danger. Athena helps save the teenaged heroine, aiding her escape and setting her on the path to meeting up with Frank, at which point the strange story takes turns both predictable and disappointing. The pairing of Casey and Frank goes well enough, but at this point the story itself becomes too much of an unoriginal hot mess to match with some of Bird’s earlier work (such as “The Incredibles”, which is Bird and Pixar both firing on all cylinders). As much as Frank initially resists Casey’s pleas for help to get to the city of the pin’s visions, he soon wholeheartedly jumps into her quest and all too slowly reveals why it is that he no longer resides in the utopia she glimpsed. The remaining threads of the story then pull together in a manner well-telegraphed to those paying attention. On the plus side, the casting was fairly well done. Robertson is plucky and adorable (sort of a Jennifer Lawrence-lite), and Clooney plays “get off my lawn” rather well for someone who started out his career as a heart-throb. Cassidy plays Athena just right, and the combination of Key and Hahn needs to get its own TV show (or she needs to be a regular on “Key and Peele”). The visuals of the shiny city with multilevel pools and flying everything are gorgeous, although occasionally the green screening doesn’t quite work as well as it should. 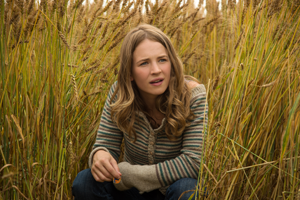 Where “Tomorrowland” falls below expectations is in how often it spends too much time wallowing in misery over discarded gadgets and people, showing the myriad ways one can disable a grinning killbot, and lecturing everyone on how little we appreciate everything around us. Meanwhile, it gives short shrift to the future promised by the eponymous “land”, in particular leaving a whole piece of what’s happening in that city completely unexplained, and the writers maddeningly deny Laurie’s Nix the opportunity to chew all the scenery within reach. Talk about not appreciating something right in front of you. 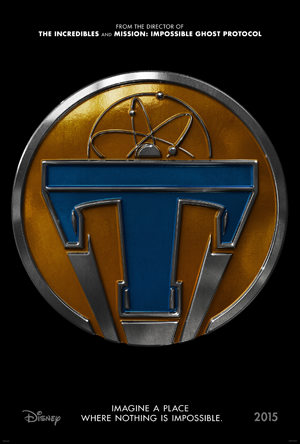 As far as the question of whether “Tomorrowland” is okay to watch with kids, I’d recommend it for children 8 years or older. Below that age, some of the violent scenes may be too disturbing. It’s actually somewhat difficult to tell which age range is the target for “Tomorrowland”, since portions of it are fairly kid-oriented but the action scenes are really too much for the smaller set. Perhaps all that jumping around between the past, present, and “future” has “Tomorrowland” just as confused as the rest of us. 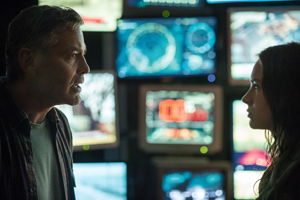 “Tomorrowland” opens nationwide on May 22, 2015. This movie is rated PG for sequences of sci-fi action and peril, thematic elements, and language. This entry was posted in movie reviews and tagged britt robertson, george clooney, hugh laurie, kathryn hahn, keegan-michael key, movie, movie review, raffey cassidy, tomorrowland by crunchymetromom. Bookmark the permalink. Great review! I felt they could have done more with the movie too.